No more, "Mommy, I'm cold." The latest and greatest in fabric technology has trickled down to the pint-sized set with affordable, high tech gear. Look for new fabrics, breathability, and great price points. Get out in the cold! Just because they're new to walking doesn't mean toddlers can't enjoy a great day on the slopes! Cute, new styles in the warmest, softest fabrics keep infants and toddlers going strong on those cold winter days. Market leader Obermeyer continues with their colorful, exciting collections for kids in its Preschool lines. Their popular I-Grow feature adds inches to prolong the season or a couple of seasons! Spyder's established Mini and Bitsy lines have been expanded all the way down to size 1, so even the littlest ones can enjoy their day on the slopes. Small to Tall grow cuffs add up to two inches on selected styles, Fast Track zippers take the frustration out of bad zipper connections, and pockets a-plenty ensure that kids can stow all the lip balm, snacks, radios and other cool stuff they want. Colors are fun and suits till rule..
More manufacturers are downsizing their popular brands. Look for boarder stylin' from Burton, and cozy comfort from Patagonia. With outerwear like this, kids of all ages can spend more time doing what they love-playing in the snow. Get the look and warmth you need. ; 2-in-1 design lets her wear it with a drop-waist or cinch-waist look. ; HydroBlock waterproof, breathable coating. ; I-Grow system lets you lengthen sleeves up to 1.5 and leg cuffs up to 2. ; Permaloft polyester insulation minimizes bulkiness and maximizes warmth. Fashion and function have combined to give you this super-sweet jacket. ; Convertible hood can be tucked in or out. ; Gusseted sleeve cuffs with adjustable tabs. ; Adjustable interior hem drawstring for a custom fit. ; Fleece chin protector, inside collar, and cuff linings. ; Interior storage pocket. ; Zippered hand pockets. ; Ski pass D-ring. This jacket goes down to a size 1! A one-piece that's perfect for winter fun. ; Durable, yet lightweight and comfortable. ; HydroBlock waterproof/breathable coating. I Grow system allows 1.5 inches in the arms, and 2 inches in the legs. ; Removable full hood with auto-adjust safety design. Fleece earwarmers. Show everyone who rules the roost with this stylish jacket. ; Sleek, sporty design is perfect for getting attention on the slopes. ; Cozy fleece lining along collar, cuffs, chin protector and ear warmers. ; Vertical zippered chest pocket. ; Tricot-lined zippered hand pockets. The Bitsy Duffy Puff Jacket is so adorable she'll never want to take it off. ; Polyester jacket is waterproof and breathable. ; Xt coating creates a honeycomb structure of micro-pores that keeps moisture out but also allows the fabric to breath. ; Spylon Water Repellent Finish repels moisture and protects against water and oil-based stains. When your littlest sassy skier needs a little help on the slopes, zip her into the Bitsy Harness Sassy Suit. 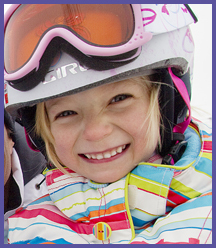 Spyder has developed a built-in harness system to make it easy to help little ones on the slopes. ; Straps wrap around the body inside the suit and attach to an external handle on the back. The handle can be tucked into a zippered compartment when it's not needed. Save your back! Polyester suit is waterproof and breathable. Now you don't have to sacrifice style for function when you're out on the slopes. ; Polyester jacket is waterproof and breathable. ; Xt coating creates a honeycomb structure of micro-pores that keeps moisture out but also allows the fabric to breath. ; Spylon Water Repellent Finish repels moisture and protects against water and oil-based stains. A one-piece that's easy to wear and use. ; Hem can be let down for extra length. ; Arm cuff can be extended. ; Full zipper front closure with hook loop. ; Belted waist with vinyl buckle. ; Zippered hand snap and flap pockets. Patagonia Kids - Baby Down Sweater (Infant/Toddler) (Acai) - Apparel Snowball armor! ; Comfy quilt-like construction. ; High-loft 600-fill power premium European goose down insulation is lightweight and compressible. ; Ultra-light and water-resistant shell fabric has high tear-strength. Burton Kids - Minishred Striker One Piece (Toddler/Little Kids) (Hydroplane) - Apparel From bunny slope to backyard fun, the Burton Minishred Striker One Piece goes everywhere. ; Snap-off hood. ; Angled zipper closure. ; Belt loops at waist. ; Reflective trim. ; Right leg cargo pocket with hook and loop flap.